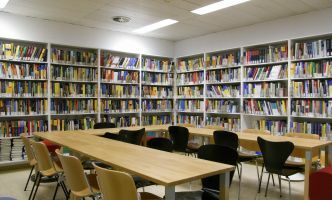 The FAM-library is assigned to FAM - Financial and Actuarial Mathematics (E105-01 & -05) and is one of the libraries of the Department of Statistics and Mathematical Methods in Economics (E105) and a branch of the Main Library of the TU Wien. In 1998, when FAM was founded, the staff members ordered books for their research as well as for teaching. In the meantime, we are proud of having more than 2500 books and we try to keep our library up to date. Not only students and researchers from TU Wien, but also from other universities come to us for borrowing books. Furthermore, actuaries and other people from the private sector quite often find literature for their work in the FAM-library. With the search field on the starting page (= "Simple Search" ["Einfache Suche"]) you often find hundreds of results as CatalogPlus does not only search within autors and titles and it does not only find books but also e-books, theses, articles, reviews, and much more. We suggest the "Advanced Search" ["Erweiterte Suche"] if author and/or title is known. With the faceted navigation [Facettennavigation] on the left side you can apply multiple filters, e.g., "Medium > Book" and/or "Language > English". With "More options" ["Mehr Optionen"] you can open a sub menu where you can filter for more than one option, e.g. "Medium > Book and E-Book". Online recources (e.g, e-books) can usually only be seen or downloaded from employees and students after sign-in. For hardcopies (e.g., books, theses) click on "Location" ["Standorte"] and find one or more libraries. Open the libraries with the "+" symbol to figure out if a copy is available. For information on the libraries click on the information-symbol ("i") after the name of a library. At departmental libraries (starting with "EXXX Institute of ...") please also look at the "Collection" ["Standort"] of each copy as departments very often have difference collections (sub libraries) on different floors. Within CatalogPlus FAM-library is the collection "FAM: Financial and actuarial mathematics" of the departmental library "E105 Institute of Statistics and Mathematical Methods in Economics". A list of books can be found here. If you want to borrow certain books from FAM-library, please write an e-mail or call us (see contact details below), so we can check the availability of the books. You can also just visit the library and search for books yourself. If books are available, we usually lend them for 4 weeks. Renewing a book is possible if nobody else asked for it. We do not have fixed opening hours - the library is mainly open Monday to Friday from 14:00 to 16:00, sometimes earlier, sometimes later. To be on the safe side, we ask you to contact us before you come to the library. We can also make appointments outside the given time above.